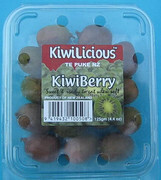 Commercial Kiwiberry (Actinidia arguta) seed. A good percentage of Actinidia arguta grown from seed come true to type from seed. - Very flavourful and sweet. +$2.7 USD International air letter postage. Fresh seed germinates in 2 - 3 months at 10°C, stored seed can take longer. Pollinated by bees, insects. But the plant is not self-fertile. You need at least 1 male plant for pollination of up to 8 (close by) female plants.